I think the reason is two-fold for the heart/lung shots. For one, it's a lot easier to hit them in the torso from a good distance than in the head. Second, a head shot if going to pretty much destroy the skull. In game, that doesn't happen (yet) but in real life, a big part of the hunt is to get a good trophy to mount. I could see the player being penalized for a head shot later as they patch the game. I had a decent size buck (around 135 rack size) get stuck in a tree. What's funny is that I hesitated with the kill, but like you, I had already hit it. I suppose I could have waited until it died, but the glitch was bothering me so I ended it. Back to the shooting range tomorrow for sure. Is this right - you can't invert the mouse? Not yet. I don't know if they'll be putting control options out on the next update, but I'm sure it will be in the near future. You should just turn your mouse upside down. Literal inversion. Depending on your mouse and drivers you also might be able to invert the mouse in Windows itself before you play then switch it back when you're done. But ya, it's a little weird to have the lack of keyboard remapping or inverted Y-axis in a modern game. Anyone notice if the rifle round drops at all en route? I've had a couple of kills and not noticed that it does but I haven't taken any really long shots yet. Also, careful if you're firing down at a sharp angle from a stand. My scope showed a clear shot of a very nearby doe, but that waist-high wall caught the round and off she went. Pretty sure there is no bullet drop nor any effect from the wind. Finally got my first whitetail buck. It's been a string of bad luck, had 2 run into the water and die not allowing me to retrieve them. So I downloaded this game after reading Rabbits post about it, figured it was worth a try at the expensive price of free, I'm looking forward to giving it a try this evening when I finally get back home. My username is Mysteri0 and my Character name is Israel Knight so friend me up guys. Ok, so I tried this out....and came out pretty bored. Its a lovely, peaceful environment to wander around in, which is nice, and definitely well done for a free game. I read the PDF guide, figured out how it works, and set off. It took me a good 5-10 minutes of wandering before I found my first deer track. Then, I followed a bunch of tracks...and lost the trail. A few more minutes of wandering later, I pick up the trail...and lose it again. Half an hour had gone by, and I had done absolutely nothing. I followed the path indicated by my hunting gizmo, looked around the range of where it said the deer should be - nada. I felt like I was in a forest exploration sim. At least in The Path, wierd creepy stuff happened. Here, I felt like I was going nowhere. Looking back and reading through the thread, I realize that I was probably moving too quickly - which basically meant I shouldn't have bothered. Slow movement is one of my pet peeves in games, and a game where everything is designed around moving slowly is like water torture. In my book, anything you need to approach that slowly is not worth approaching at all. But hey, that's just me - clearly you guys are enjoying it. I'm done with The Hunter - as I suspected, I just don't have the patience, and just like to spend my gaming time in more involved scenarios. Do any of you happen to know the number for Guinness? It's not for my rack size, but for the world record for crawling in a virtual world. I'm guessing I tracked this guy on pure stomach for about 1.2 km. Turned out to be worth it, though. Ok, we need to get the OP updated with a list of Goodjers playing so we can get all friended up and stuff. Rabbit's article finally tempted me into checking out this thread and it's of epic length already! I'm in as Farscry, my dude's name is "Sebastian Grove". This game has driven me up a wall. I've tracked about ten deer in almost as many hours, and have had three clean shots total. Trouble is, I'm a terrible shot apparently. I wounded one and I imagine it's dying somewhere but I couldn't track its blood because I didn't even know I winged it. I promise to quit this game for good once I finally kill one of those buggers. Woot! We're still 2/8 short of Stengar though. You're going down Stengar! I dunno what's with you guys and the prone stuff. I've never once used anything but standing and crouching and I've had deer nearly trip over me before. Sigh.. I had a 527ft shot on a mule buck last night. Unfortunately it was so far away and took me so long to get over there that he was long gone and wouldn't respond to calls. I suspect he either died somewhere or was hung up with the fleeing tree bug, but I only had about 20 minutes to search for him because of the forced game quit timer and my time ran out. Frustrating. I did get a 429ft shot on a whitetail, but it didn't count for the Leaderboard since it was a doe. I look forward to today's patch. Can't wait to try the 30-06 for real and the camera is being added as well. I am so addicted to this game. Even though I cant kill a deer for my life the tracking and stalking aspect of it is so fun. I get so excited when I spot the deer and I always miss my shot because I don't wait until he gets close enough. Such a nice relaxing and exciting game at the same time. I am hooked. One question though. When I find 3 tracks I get a cone and a circle. Should I be looking in the area this is both in the cone and the circle? Circle should be the range which the animal could have traveled based on the "freshness" of the track. The cone indicates probable direction. The cone is usually right, but I've seen animals stray way the hell off of it. For sure. The cone cuts out a little 'slice of pie' from the circle. That area is a prime spot to look for your prey. If the circle is small, it means the deer is damn close. Yeah, it's rare I drop down into a prone position. I just didn't want to take any chances since this is the largest rack I've seen in-game. If I have a clear shot on a deer and I don't have any foilage blocking my sight, I usually drop down to prone for a steadier shot. The problem is that animals will zig-zag, naturally. Or occasionally turn sideways to look at something. If tracks were generated at that point, the cone can be very misleading. I have much more luck trying to 'think like a deer' (even if this is just digital deer) and sort of follow what seems a natural direction to go into, rather than what the cone tells me. Unfortunately it was a Doe, so the shot doesn't count in the stats. Even better I got it in the neck and it just dropped instantly, so I didn't have to chase it down. If I happen to be tracking a group of deer, it can also be helpful to check out the other tracks (don't have to click on them with the HunterMate, just look down at the direction they're going). There's been many times I can't find a "fresh" trail (solid red glow) for the animal I'm currently tracking, but I can see several (red arcs) for the ones traveling with it going in a different direction than the cone is telling me this one went in. I follow them instead and usually link back up with the currently tracked deer. I read on the site that you need to go up to the carcass to confirm the kill. Is it ever not actually dead? Anyone find one still squirming and have to finish it off? Often. I'd say about 10-20% of my kills end up that way. They don't really squirm, rather, they just lay down and wait for the inevitable. I am completely hopeless at this game. .. I finally got a shot on a doe last night, but it disappeared. I found it's blood all over the place, but no deer. It is great though, wandering through the woods like that and finally finding a target really makes you tense. I think it's a lot more exciting than the real deer hunting experiences I've had. Well, at least they're not struggling. Here's something interesting I just found out. 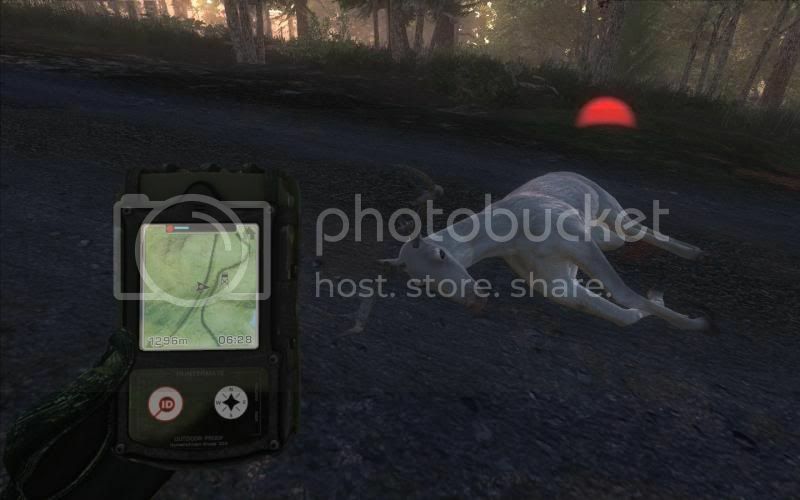 I was perusing the site and looking at some of the previous news posts and there was one made by the in-game character "Doc" that made a brief mention of spotting a "genuine albino buck". I searched their forums and sure enough, there are albino deer in the game. Extremely rare, but they're there. Do you need to subscribe to become a Super Warden to see one? ...I'm bitter because I want to look at turkeys and they want me to pay for that!